Mistral collection could be described as an offshoot from Network collection, since it has married the selfsame design inspiration but here the interpretation is somewhat lighter, having focused on more limited dimensions (in the absence of an element for holding objects), and is also ideal for metropolitan spaces, balcony and terrace. 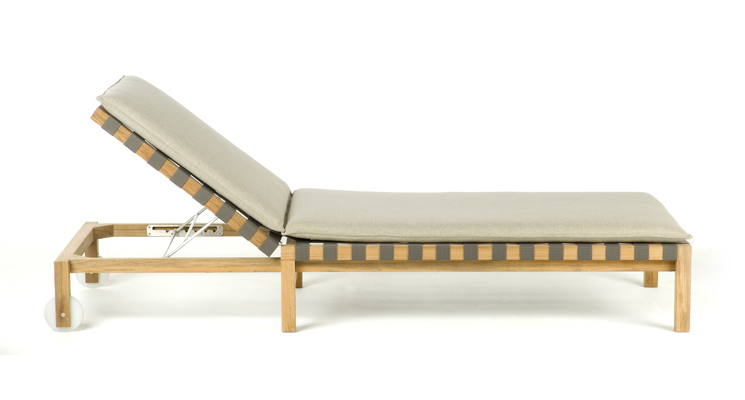 The structure in solid teak is available with tobacco, grey or olive belts. The classic string chair finds a new outdoor dimension, where polyester trails its infinite filaments around a tubular stainless steel structure in one continuous outline. Neutrality is ignited by cushions of different colors; lightness is given by air vibrating through the cords. Harp is a celebration of a craft manufacturing: a never-ending weave of cords that twine the metal frame drawing lines that look continuous to the human eye.